Francisco José Rodríguez Sr. (born January 7, 1982), nicknamed "Frankie" and "K-Rod", is a Venezuelan professional baseball pitcher for the Milwaukee Brewers of Major League Baseball (MLB). He has also played for the Anaheim Angels / Los Angeles Angels of Anaheim, New York Mets and Baltimore Orioles. Rodriguez pitched for the Angels from 2002 to 2008, and the Mets from 2009 to mid-way through the 2011 season. He served as the closer for both teams. He then pitched for the Brewers until July 2013, mostly in a setup role, and for the Orioles for the rest of 2013 before returning to the Brewers for 2014. Rodríguez holds the major league record for saves in a single season, with 62, set in 2008. He is a three-time league leader in saves (2005, 2006, and 2008) and a six-time All-Star. Rodríguez signed as an undrafted amateur free agent in 1998. Originally a starting pitcher, Rodríguez moved to relief pitching in 2002 after elbow and shoulder injuries shortened his 2001 minor league season with the Lake Elsinore Storm. In 2002, he made his major league debut. At the time, he was the youngest pitcher in the American League. Because of the multiple injuries to the Angels bullpen, the club brought him up during the middle of September. He emerged as a postseason relief hero, winning five postseason games despite never having won a Major League game before. Although he threw a lively fastball, his sharp-breaking curveball was his most effective pitch. Because Rodríguez had played very little in the Major Leagues, hitters in the postseason had very little idea what to expect from him, a situation that often favors the pitcher. In the 2002 ALDS against the New York Yankees, he got two victories (with 1 win resulting from a blown save). The Angels won the division series against the Yankees in 4 games. During the 2002 ALCS vs the Minnesota Twins, he went 2–0 with seven strikeouts in four and one-third innings. The Angels won the ALCS against the Twins in 5 games. During the 2002 World Series against the San Francisco Giants, he had a 1–1 record with 13 strikeouts in eight and two-thirds innings. At 20 years, 286 days old, he became the youngest pitcher ever to win a World Series game. The Angels won the World Series in 7 games. During the 2004 ALDS, Francisco Rodriguez had 2 losses as the Angels would eventually lose the division series to the Boston Red Sox in just 3 games. Rodriguez got his first 2 career postseason saves during the 2005 ALDS as the Angels won the division series against the Yankees in 5 games. He got one save in the 2005 ALCS until the Angels lost the ALCS to the Chicago White Sox in 5 games. Rodriguez improved on his share of the 2005 American League saves title by leading the Majors in 2006 with 47 saves, one more than the National League leader Trevor Hoffman and six more than American League runner-up Bobby Jenks. On September 10 against the Toronto Blue Jays, he became the youngest closer in Major League Baseball history, at age 24, to accumulate 100 career saves. He accomplished this feat a year younger than the previous record holder, Gregg Olson. In the 2007 ALDS, Rodriguez pitched only 1⁄3 of an inning with an ERA accumulating 54.00. The Angels lost the division series to the Red Sox in just 3 games. The Angels again faced the Red Sox in the 2008 ALDS. Rodriguez lost a game and the Angels would lose the series to the Red Sox in 4 games. On July 12, 2011, immediately following the All-Star Game, Rodríguez was traded to the Milwaukee Brewers along with cash, for Adrian Rosario and Danny Herrera. The Associated Press noted the Brewers had two potential closers in Rodríguez and their existing closer, John Axford. Rodríguez expressed his unhappiness in September to being used as the setup man to Axford. Axford finished the season with a streak of 43 consecutive save opportunities converted. In 31 games for the Brewers, Rodríguez was 4–0 with a 1.86 ERA. Overall for the 2011 season, he was 6–2 with a 2.64 ERA in 73 appearances. He had 23 saves, all with the Mets. Through 2011, he was 4th of all active pitchers in career saves (291) and games finished (445), and 8th in fielding percentage (.970). 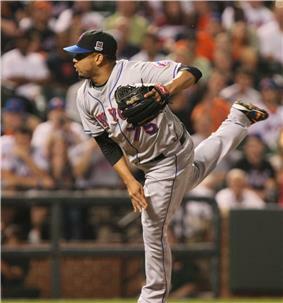 Rodriguez made 2 appearances in the 2011 NLDS vs the Arizona Diamondbacks and struck out four. 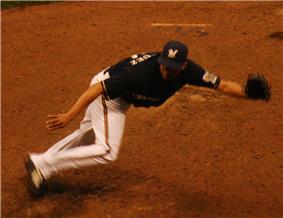 The Brewers won the series against the Diamondbacks in 5 games. He appeared in 3 games of the 2011 NLCS vs the St. Louis Cardinals. His ERA during the series was 3.00 and his new team of the Brewers would eventually lose the series to the Cardinals in 6 games. On October 29, 2012, the Brewers granted Rodriguez free agency. They re-signed him to a minor league deal on April 17, 2013 worth $2 million plus incentives if he makes the Brewers. Rodriguez started the 2013 season appearing in 25 games going 1–1 with a 1.09 ERA and 10 saves. On July 23, 2013 Rodriguez was traded to the Baltimore Orioles for minor league prospect Nick Delmonico. Rodriguez struggled in his Orioles tenure, posting a 4.50 ERA in 23 appearances with the team. On February 7, 2014, Rodríguez signed a one-year deal to return to the Milwaukee Brewers. Rodriguez was named the Brewers closer to start the 2014 season. Rodriguez began the season showing signs of returning to All-Star form, not allowing a single hit and earning 4 saves in his first 6 appearances of the season. On April 19 in a win versus the Pittsburgh Pirates, Rodriguez earned his 310th career save, his 6th of the season, which tied him with Goose Gossage for 20th on the all time save list. The next day on April 20, Rodriguez earned his 311th career save in another win versus the Pirates. With this save he passed Gossage, and tied Tom Henke for 19th on the all-time saves list. Yet another day later on April 21, Rodriguez earned his 8th save of the season and the 312th of his career in a win versus the San Diego Padres, putting him alone at 19th on the all-time saves list. Only two days later on April 23, Rodriguez earned his 9th save of the season in a 5–3 win over the Padres, giving him 9 straight saves without allowing a single run to start the season. Just two more days later on April 25, Rodriguez recorded his 314th career save, his 10th of season, in a 5–2 win over the Chicago Cubs. With this save, Rodriguez tied Robb Nen for 18th on the all-time saves list. The very next day on April 26, Rodriguez picked up his 315th career save, his 11th of the season, in another win over the Cubs, which put him alone at 18th place in the all-time saves list. Rodriguez would quickly pick up 2 more saves and would tie the record for most saves in the month of April with 13. Rodriguez would also give up only 7 total hits and no runs in 16 April appearances. Rodriguez got his first save of the new month on May 2, picking up his 318th career in a 2–0 win over the Cincinnati Reds. With this save, Rodriguez tied Rick Aguilera for 17th on the all-time saves list. Rodriguez picked up career save number 319 on May 10, putting him in a tie with Todd Jones for 16th on the all-time saves list. This save also gave Rodriguez 15 straight saves without allowing a single run to start the season. The next day on May 11, Rodriguez blew his first save and gave up his first earned run of the season, a solo home run with two outs and two strikes in the 9th to New York Yankees first baseman Mark Teixeira. However, the Brewers would go on to win in the bottom of 9th on a walk-off single by Mark Reynolds, giving Rodriguez the win. Another two days later on May 13, Rodriguez earned his 320th career save, putting him alone at 16th on the all-time saves list. The next day on May 14, Rodriguez earned his first loss of the season, giving up 3 runs to the Pittsburgh Pirates in the top of the 9th, in a game that was tied 1–1. On May 16, Rodriguez tied José Mesa for 15th on the all-time saves list with his 321st career save in a victory over the Cubs. On May 26, Rodriguez blew his second save of the season, giving up two earned runs to his former club the Baltimore Orioles, blowing a 6–4 lead. The Brewers would go on to lose 7–6 in 10 innings. However the next night on May 27, Rodriguez would pitch a perfect top of the 10th, and would get his second win of the season as this time it would be the Brewers who would win 7–6 in 10 innings. After not getting a save opportunity for 10 days, Rodriguez earned career save 322 on June 5, passing Mesa for 15th on the all-time saves list. Rodriguez began to falter more in June, however, as he began the month of June allowing 7 runs (all earned) in 7 innings. Rodriguez suffered a loss against the Reds on June 13 when he entered into a tie game in the ninth, allowing what went on to be the winning run. 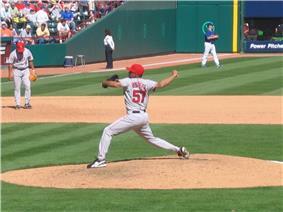 Rodriguez would rebound the next night however, allowing the Reds no hits and earning his 21st save of the season. On June 17, Rodriguez earned his 326th career against the  On June 28, Rodriguez picked up his 331th career save, his league high 27th of the season, against the Rockies, putting Rodriguez past Wetteland for 12th on the all-time saves list. On July 6, Rodriguez was selected as an All Star for the 5th time in his career, and the first time since 2009. On August 15, Rodriguez recorded his 341th career save, also his league leading 37th save of the season, tying him with baseball Hall of Famer Rollie Fingers for 11th on the all-time saves list. The next night on August 16, Rodriguez picked up his 342nd career save, putting him past Fingers for 11th on the all-time saves list. On August 27, Rodriguez stuck out Abraham Almonte of the San Diego Padres for his 1,000th career strikeout. On September 20, Rodriguez recorded his 347th career save, tying him with Randy Myers for 10th on the all-time saves list. On September 27, Rodriguez recorded his 348th career save, also his 44th and last of the season, putting him alone at 10th on the all-time saves list. Rodriguez finished his strong 2014 campaign posting a 5–5 record with a 3.04 ERA, 73 strikeouts, and converting 44 saves in 49 opportunities. On February 27, 2015, the Brewers re-signed Rodriguez a two-year, $13M deal. Milwaukee also holds a club option for the 2017 season. Rodriguez will be paid $3.5M in 2015 and $5.5M in 2016. The deal also includes a $2M deferral and a $2M buyout on the Brewers' 2017 club option worth $6M. On June 6, Rodríguez recorded his 358th career save and his 10th of the season, tying him with Troy Percival for 9th on the all-time saves list. Two nights later on June 8, Rodríguez recorded his 359th career save, putting him past Percival for sole possession of 9th on the all-time saves list. On July 6, Rodriguez was selected as an All Star for a second consecutive season and for the 6th time in his career. On July 8, Rodriguez recorded his 367th career save, tying him with Jeff Reardon for 8th on the all-time saves list. On July 17, Rodriguez recorded his 368th career save, passing Reardon for and putting him alone at 8th on the all-time saves list. On August 16, Rodríguez recorded his 377th career save tying him with Joe Nathan for 7th all time. On August 19, Rodríguez recorded save number 378, passing Nathan for 7th on the all time list as well as making him the active career saves leader. On September 27, Rodríguez finished his 600th career game, becoming only the 17th pitcher all time to finish 600 games. Rodríguez throws four pitches. He came up throwing a hard four-seam fastball that averaged 95 mph in 2007, but has settled in the 91–94 mph range through the 2012 season. He also throws a two-seam fastball at 90–93 mph. His off-speed pitches are a curveball at 76–79 mph and a changeup at 82–85 mph. He uses his changeup more against left-handed hitters. It has a whiff rate of 48% since 2007, the third-highest among all changeups thrown by relief pitchers. Rodríguez has been a strikeout pitcher throughout his career, compiling an average of 11 strikeouts per 9 innings pitched. Rodríguez's nickname of "K-Rod" became popular during the 2002 playoffs. It is a play on Alex Rodriguez' nickname "A-Rod," the nickname of New York Yankees third baseman Alex Rodriguez, with "K" representing the common abbreviation for strikeout. Rodríguez is a practitioner of the Santería religion. Rodríguez has competed in the 2006 and 2009 World Baseball Classic for the Venezuelan team with his former teammate Johan Santana. Rodriguez has 5 children. On June 13, 2009, New York Yankees reliever Brian Bruney criticized Rodríguez, calling his antics on the mound "unbelievable" and saying that Rodriguez has "got a tired act," after seeing his reaction to earning a blown save in 2009 against the Yankees where teammate Luis Castillo dropped a pop-up with two outs in the ninth inning allowing the Yankees to score the winning run. Rodríguez responded by saying "somebody like that, it doesn't bother me," and suggesting that Bruney "better keep his mouth shut and do his job, not worry about somebody else. I don't even know who the guy is. I'm not going to waste my time with that guy. Instead of sending messages through the paper, next time when you see me at Citi Field, come up to me and say it to my face." During batting practice the following day Rodríguez confronted Bruney on the field, pointing and shouting at him before teammates from both sides separated the two. On August 11, 2010, Rodríguez was arrested after allegedly assaulting Carlos Pena, the father of his girlfriend Daian Pena after the Mets lost a game at Citi Field. Rodríguez was reportedly upset that he made disparaging remarks about Rodríguez's mother. Rodríguez remained in police custody at Citi Field on a charge of third-degree chief operating officer Jeff Wilpon said. Rodríguez suffered a torn ligament in his right thumb, possibly during the altercation, requiring season-ending surgery. The Mets put Rodríguez on the disqualified list, intending not to pay him until he was physically able to perform. On September 22, 2010, Rodriguez was back in Queens Criminal Court facing seven counts of criminal contempt after sending numerous text messages to Daian Pena in violation of the order of protection. The judge imposed bail of $7,500, which Rodriguez posted. Rodriguez was charged with domestic violence in Wisconsin relating to a September 17, 2012 incident in which he allegedly hit and kicked the mother of his child. He was facing a fine of $10,000 and/or up to 9 months in prison. Charges were subsequently dropped against Rodriguez when the victim and the eyewitness (housekeeper) both returned to Venezuela and did not respond to the district attorney on the case. ^ "Press Release: Francisco Rodríguez Named Winner of the DHL Presents the Major League Baseball Delivery Man of the Month Award for June". DHL.com. July 9, 2008. Retrieved December 9, 2008. ^ DiGiovanna, Mike (August 27, 2008). "Someone will be odd man out of Angels' playoff rotation". ^ Bauman, Mike (September 28, 2011). "Overhauled pitching fuels D-backs, Crew". MLB.com (MLB Advanced Media). Archived from the original on September 29, 2011. ^ "Brooks Baseball · Home of the PitchFX Tool - Player Card: Francisco Rodriguez". Brooks Baseball. Retrieved September 24, 2012. ^ "Francisco Rodriguez Statistics and History - Baseball-Reference.com". ^ Baxter, Kevin (June 27, 2007). "Religion under wraps". Los Angeles Times. Retrieved December 9, 2008. ^ "K-Rod, Bruney separated by teammates". espn.com. Retrieved 10 September 2014. ^ Sielksi, Mike (August 12, 2010). "Mets' Rodríguez Suspended Following Alleged Assault on Girlfriend's Dad". ^ RONALD BLUM, AP Sports Writer Aug 12, 7:43 pm EDT (August 13, 2010). "Suspended Mets' Rodríguez freed without bail". Sports.yahoo.com. Retrieved August 18, 2010. ^ "Former Brewers pitcher charged with domestic violence". Milwaukee Journal Sentinel. November 1, 2012. Retrieved November 1, 2012.